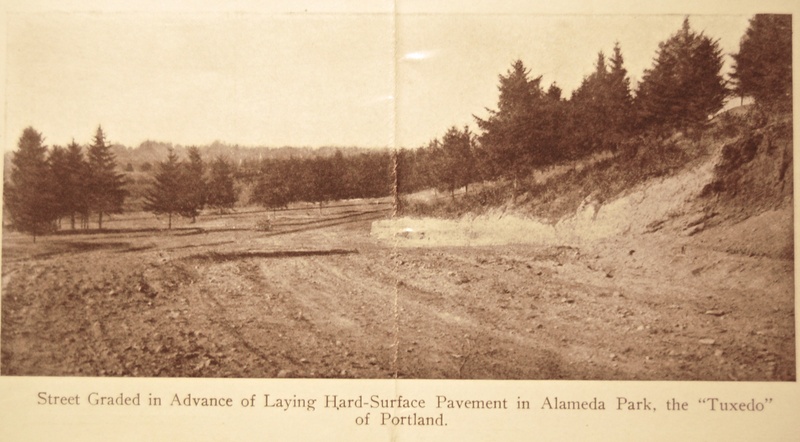 We’ve come across a remarkable piece of propaganda recently that offers a unique look into the earliest days of Alameda Park. 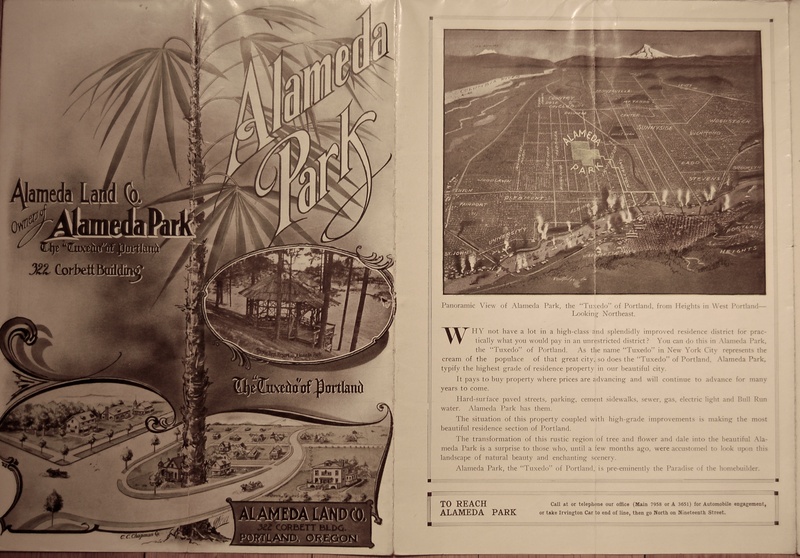 It’s a brochure that provides photos and some very creative narrative, all designed to get potential buyers into Alameda Park. It’s different than the small brochure you might have seen. This is a three-color (black, yellow, green) glossy, multi-fold pamphlet. Interesting to note how the photo/map view below right is facing east, with Mt. Hood in the distance, instead of the typical north-south orientation. See what other interesting details you can find, like all the steamships in dock. Be sure to check out the “Rustic Rest Resort” on the cover, which looks more like a coastal cabana than something you’d find in the woods and fields of this new neighborhood. We think it was a gazebo like “porch” perched somewhere along the Alameda Ridge. Click on the image for a full-size look at the map and the text. Text and images in the brochure go on to talk about the many virtues of the property—descriptions that are a bit ironic since when this went to print, the “Tuxedo” was little more than gravel streets, some concrete curbs, mud and brush. 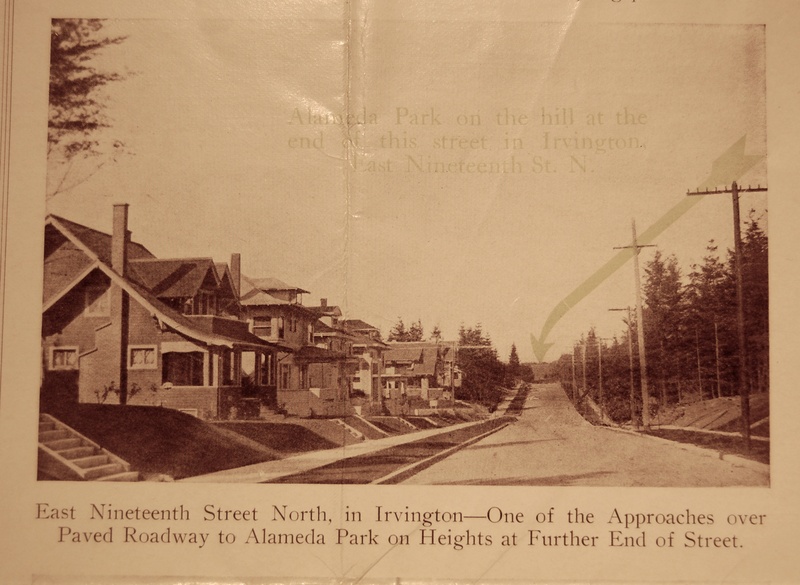 The green text is faded, but it’s pointing out that tiny patch of mud and trees at the far north end of this lovely Irvington street view, as if to say: “Alameda…it’s up there.” Throughout the brochure, Alameda Land Company boosters tried to build their own credibility on the back of Irvington (which was developed earlier and by a different company that didn’t much appreciate this kind of attention). And here’s one that took some real initiative: calling the Irvington School the Alameda School. Just to be clear, this is the original Irvington School. There was never a school like this in Alameda. Period. It’s a bald-faced lie in black and white. 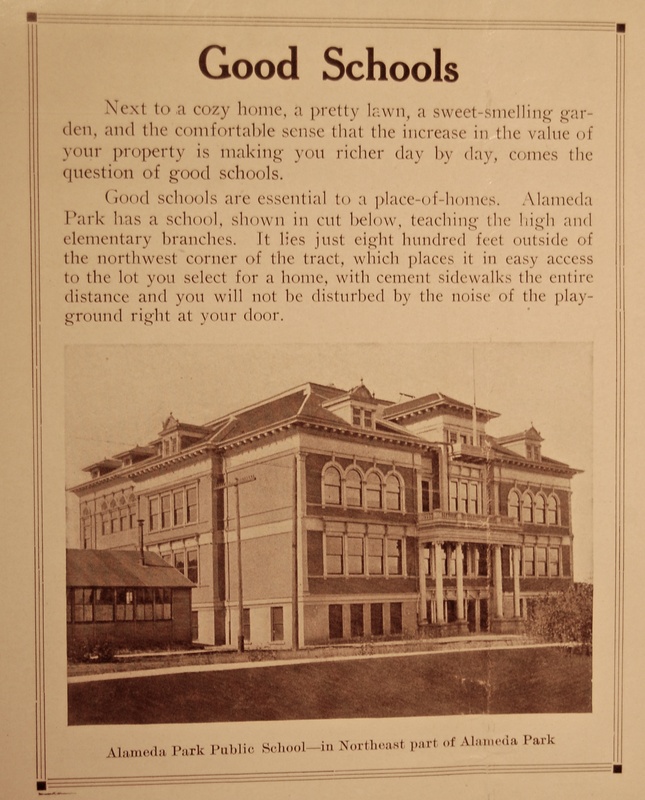 Don’t believe everything you read: there was never a school like this in Alameda…it’s the original Irvington School. Looking east on Mason, just west of NE 29th Avenue. Note that the streetcar tracks have not arrived yet. A later photo taken from nearby looking north shows the railing and a banner that reads “Alameda Land Company Tract Office,” which appears to be on the roof too. 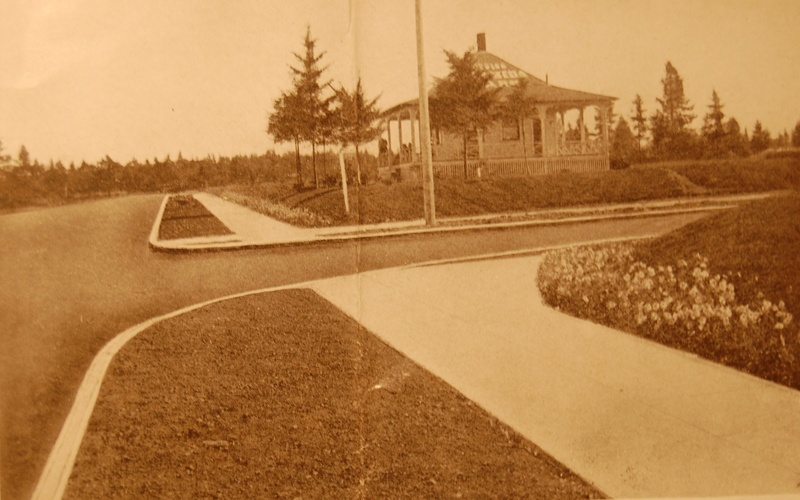 And saving the best for last: this view of NE Regents Drive, looking downhill, long before the neighborhood we know today. About as close as we get to time travel. With thanks to our friends at the Architectural Heritage Center for sharing. I love this marketing piece! But that invented school, that’s just over the top. Fascinating! Thanks, Doug. Regents doesn’t look very steep in the photo. Great to catch how the Willamette looked, with Swan Island still an island and the ships. Quite the bustling city. Good stuff, Doug. I wonder where the “Rustic Rest Resort” pictured on the cover of the brochure was located? That is really cool, I grew up on the corner of 28th and Mason…. Wonderful images as always…! Just guessing… would that be Deadman’s Hill (Stuart Dr) in the upper right portion of the “soon-to-be-Regents” pic? I am lucky that I went looking in December, otherwise the trees that grow on 19th today would have completely blocked the view up the street. In the original image, “Alameda Park” is visible as a distant knoll. Today, that knoll is replaced by the water tower at the Sabin Hydro Park. It is amazing to stand here today and imagine living in one of these houses with a forest across the street. Time travel indeed.